The Saints are out of the league cup after a 4-2 defeat at Llanidloes Town FC. After a going 1-0 down in the 5th minute to a headed goal we equalised when Adi Lawford got on the end of a mix up between Adam Worton and Kris Williams(keeper), Lawford rolled the ball into an empty net 1-1. Although we were on the back foot we were in the game and looked to counter attack at every opportunity. 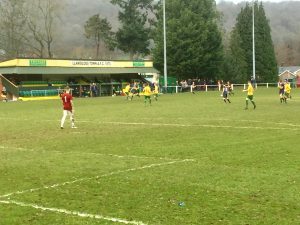 The game turned in Llanidloes favour when they scored in the 40th and 42nd minute, Connor Bird netting the third goal. The second half saw our Captain Adam Finn having to leave the field of play with a head injury which he sustained in the first half after a clash of heads with Dewi Allen. Goal keeper Tom Bevan made two great saves to keeps the hosts out however, he had no chance from a Peter Rees’ lob after a mistake in midfield let the nippy striker in. Full back Will Goodwin sent over an inch perfect cross to Jack Biggs who headed in past a stranded Williams to make it 4-2. The last ten minutes saw us play our best football of the game but to their credit the hosts had done more than enough to go through to the next round. Man of the match Tom James. The Reserves drew 2-2 at Forest Road against Llandrindod Wells FC Reserves. Top scorer Chris Assirati and Rhod Jones with our goals.